This is a sponsored post from FolkArt, Plaid, and Blueprint Social. I received materials and compensation to create a project. Finished project, text, and opinions are my own. I found this tray at a yard sale. I really had no idea what I was going to do with it, but knew I had to have it because of its pretty shape. I decided to paint it using FolkArt Stencils & Paints and I love how it turned out! First, I gave the tray a coat of primer and let it dry. Then I painted the tray with one coat of FolkArt Titanium White paint and let it dry. 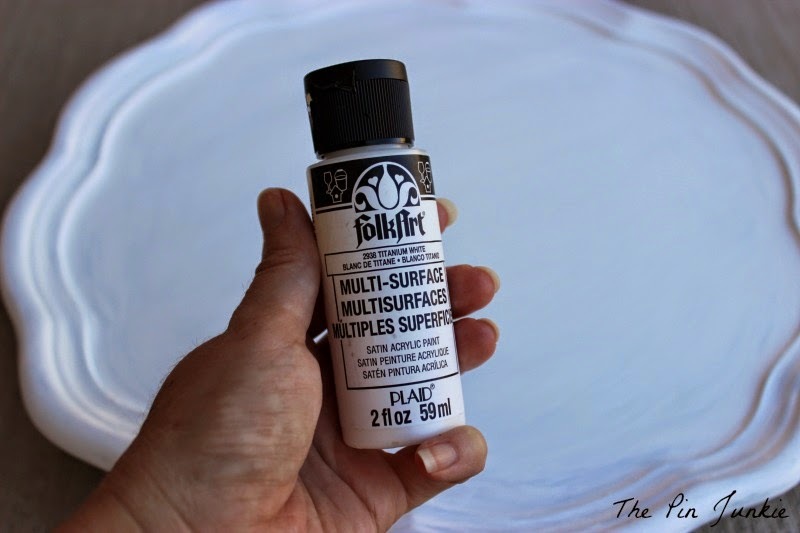 I love using FolkArt multi-surface paints because they work on many surfaces and the non-toxic formula is water based for easy clean up. Next, I applied the stencil adhesive to the back of the stencil. 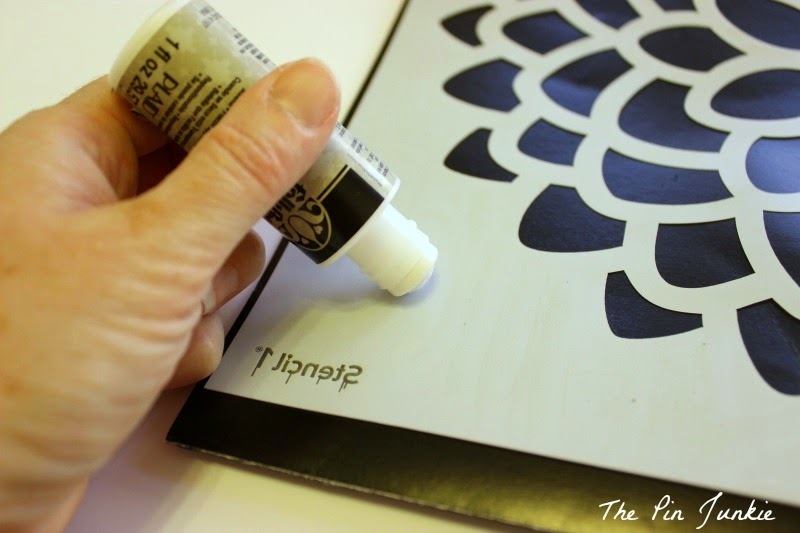 This is a really important step because the adhesive keeps the stencil from moving while you're painting and ensures that you get nice clean lines on your stenciled design. I was glad the adhesive was repositionable since I needed to move it a few times to make sure I placed it right in the center of the tray. After I placed the stencil on the tray, I used two coats of FolkArt Steel Gray for the stencil pattern. After painting, I carefully removed the stencil and allowed the paint to dry. That's all there is to it! 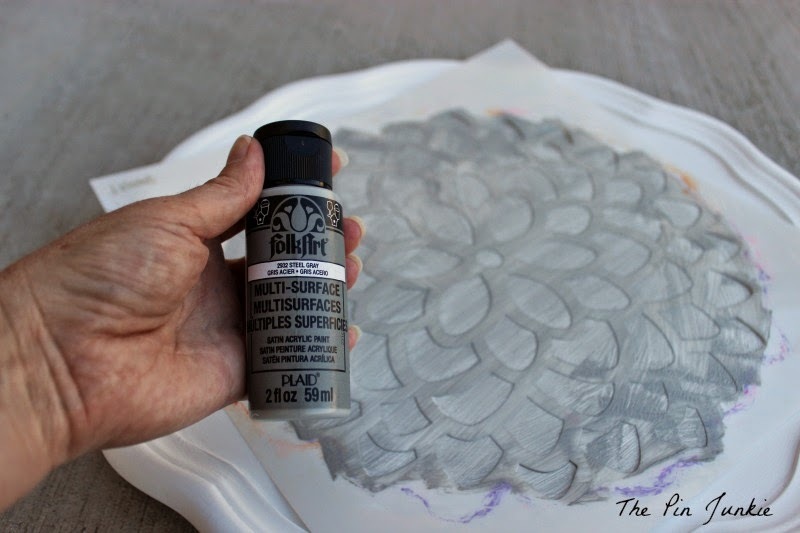 FolkArt stencils and paints really make painting projects easy! Here's the before and after. I love the shape of the tray and now I love it even more with a new coat of paint and a pretty design. There's just something really satisfying about updating something that's old and shabby and making it pretty again. 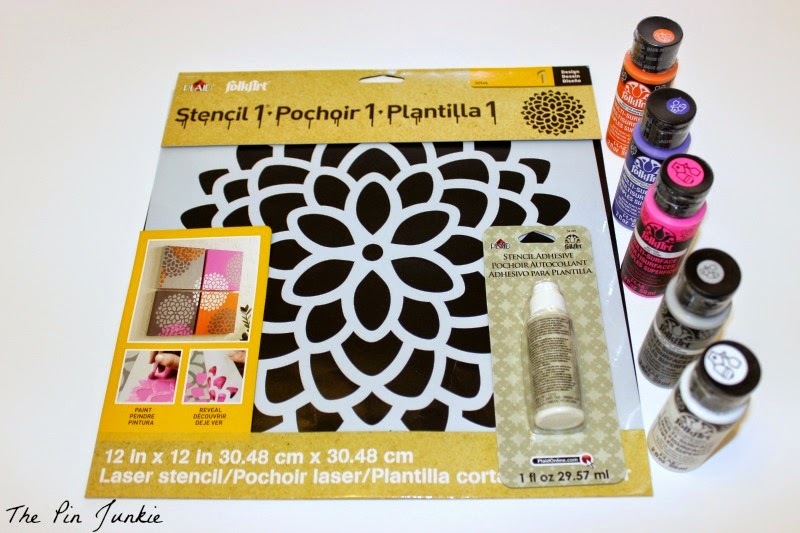 If you'd like to try the new FolkArt paints and stencils they're available at Michaels. So pretty - what a great idea ! Pretty and something I could have the kids help with too! Thanks for the invitation Mandee! Wow - this looks great! The next time I see something like this at the thrift store, I'm grabbing it! This is such a great project! Thank you so much for sharing it at the Twirl & Take a Bow Party. I'm pinning to our party board! What a great transformation-I love that pattern! This is SO cute! What a clever idea, thank you! Really turned out cute Bonnie! I love stenciling and that is a beauty. Thanks for sharing with SYC. Oh Bonnie I think this is gorgeous, I'm loving it. I've been wanting to get a stencil "zebra" and stencil table top, I think I will jump on it. Thanks for sharing, saw at Thursday Favorite Things, I'm new g+ following....hugs and happy blogger. This is really pretty! 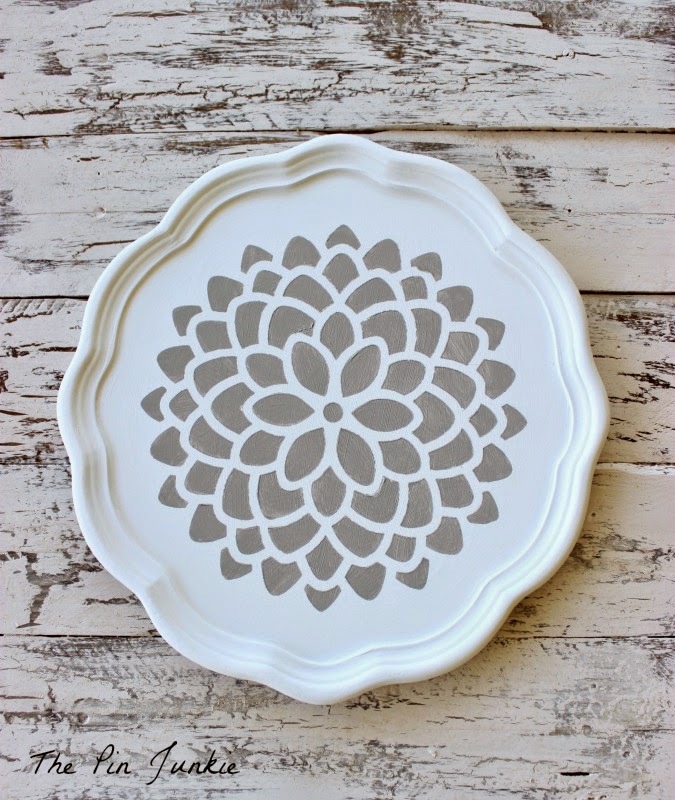 I love the white and gray combo, and the stencil design you used! Thanks for the feature Laura! I added your button to my features page. Thanks so much for the feature Katie! I appreciate it! How do you protect the paint from scratching off or getting wet? Is it non toxic paint and can you use it for food? I thought about using a clear coat varnish to protect the paint, but I really like the matte finish of the paint and wasn't sure I wanted a glossy finish from a varnish. The paint is non-toxic and probably would be ok with food. Great find, such a nice shape. Love what you did with it. This is adorable! Love the pattern! Great idea! We would love for you to come and link up with us at Your Designs This Time. What a cool idea! I love how it turned out. 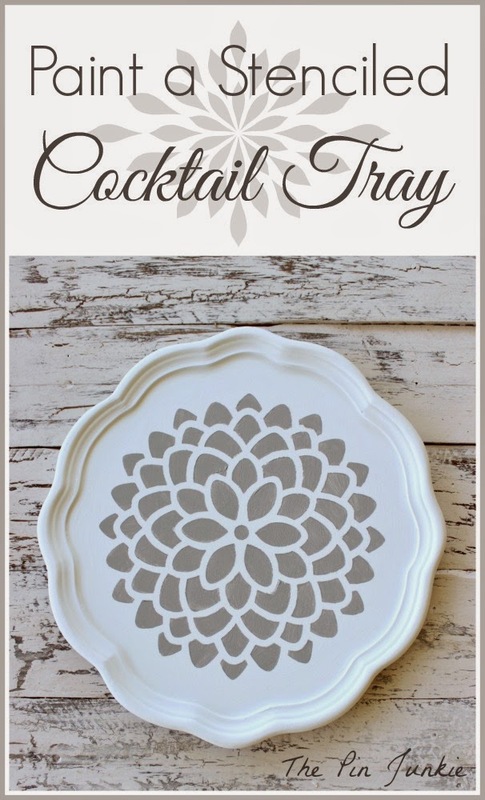 I love this tray--and it doesn't hurt that I have the same stencil. :) I'm featuring you today at Mabey She Made It. Thanks for linking up! It turned out so beautifully! What a pretty transformation; I love the colors you chose. Thank you for sharing at Inspire Me Wednesday. Featuring you in this week's issue. This is super cute and I love the stencil you chose. Thanks so much for linking up to Your Designs This Time! Simple, yet so beautiful ! Love it! So pretty! And it would make a great gift idea for a wedding or housewarming! I love how you transformed the thrifted tray! It looks so modern now. It's beautiful! I LOVE your tray....what a gorgeous transformation! I just wanted to let you know you've been featured at The Project Stash! Stop by tonight at 8:00 pm to pick up your featured button & link up your latest creations! Just gorgeous! Featuring you tonight when my link party opens. love how it turned out!! It is amazing how paint can change the entire look of an object!! Thanks for sharing this over at Bewitchin Projects Block Party, hope you will join us again this Sunday! So inspiring! 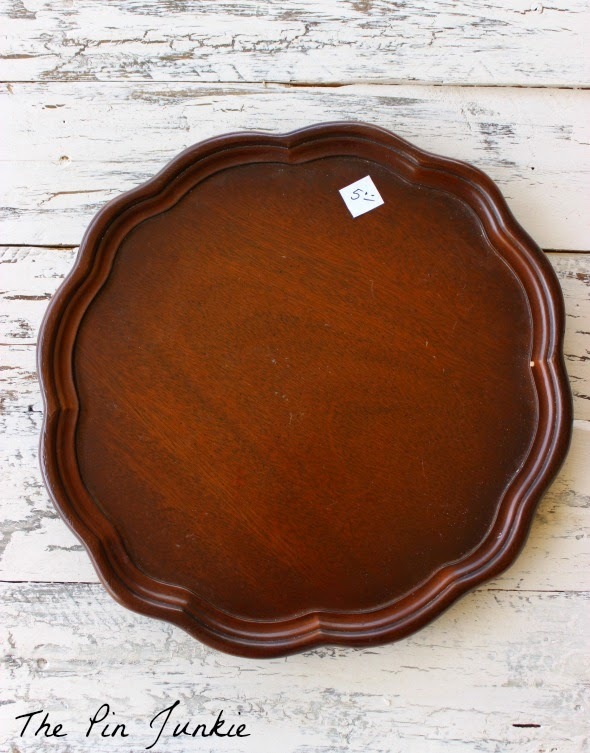 I would have snagged that tray for the pretty shape too, but maybe not known what to do with it. Your project turned out beautifully, and your tutorial is great. Thanks for sharing with us at Wake Up Wednesday! I love this idea - super easy and cute! Thanks for linking up! Love this project Bonnie! You've been featured at Gingerly Made today! Thanks for linking up and I hope you'll join us again this week. Thanks for the feature Ginger! I appreciate it!